Crimps 15 mm pumps ONLY. High-quality, multi-tooth crimp with a tight crimp seal every time, ensuring that crimps are long-lasting and reliable. Execution of bottle crimping is fast and simple making the tool ideal for small-scale production or lab use. This crimping tool allows crimping with the perfume bottle pump actuator (push-button) in place, simplifying the crimping process since there is no need to remove and replace it. Very strong body composed of anodized aluminum and electroplated steel parts, making it extremely corrosion and wear resistant. Top-quality internal wear parts that are hardened to give this crimping tool a very long working life. Dimensions: 190mm long, 40mm average diameter, 1.1kg weight. 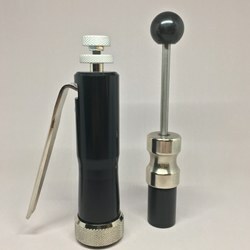 This tool is helpful for small perfume-packing businesses to start manufacturing perfume without the expense of a large crimping machine. The crimped pumps produced by this tool are as good as those produced by a bigger machine. This is a low cost alternative to the press for fitting 15 mm collars and crimp-less pumps. Very simple and easy to use. A compact, hand-held design that is easy to use. Just place the bottom part of the tool over the collar or crimp-less pump, hold the top on the knob, and use the silver sliding weight to tap the collar down into position.